Extraordinary large format map of the West Indies published in 1818 by cartographer John Pinkerton. 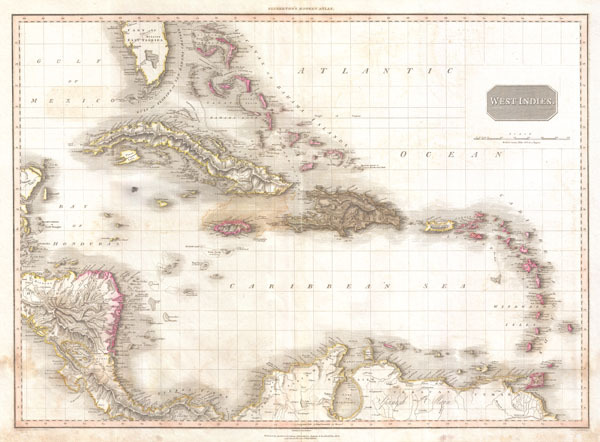 Centered on the island of Hispaniola or Santo Domingo, this map covers from the Bay of Honduras to the Windward Isles, and from Florida and the Bahamas south to Lake Maracaibo and the Spanish Main. Includes Cuba, Jamaica, Porto Rico, Hispaniola, the Bahamas, and southern Florida. In Florida there is a large inland lake, labeled Mayaco, which is no doubt an embryonic representation of Lake Okeechobee. Pinkerton offers extraordinary detail throughout noting both physical and political elements, including shoals, reefs, and other undersea dangers. Possibly the most attractive English map of the West Indies to appear in the early 19th century. Drawn by L. Herbert and engraved by Samuel Neele under the direction of John Pinkerton. The map comes from the scarce American edition of Pinkerton's Modern Atlas, published by Thomas Dobson & Co. of Philadelphia in 1818. Very good condition. Very minor damp staining lower left corner, mostly confined to outer margins. Transference near Jamaica and northwest of Cuba. Original centerfold. Blank on verso. Rumsey 0732.049. Phillips (Atlases) 724. National Maritime Museum, 409. Phillips (America), p. 1062.